In 2010, Girard-Perregaux will celebrate a double anniversary: thirty-five years of the ‘Laureato’ collection and forty years since its first quartz wrist watches. The Manufacture, now renowned the world over for its mechanical movements, also played a pioneering role in the story of quartz watches. It was in fact Girard-Perregaux that set the decisive frequency of 32,768 Hz, since adopted by all manufacturers as the universal standard. This progressive step, at the time revolutionary, was one of the Brand's great innovations. Visionary spirit and technical progress have always been in Girard-Perregaux's genes, and the Brand has obtained almost 80 patents in the watchmaking field. It is an extraordinary heritage, a part of which is celebrated by this commemorative model. Subtly redesigned and equipped with a new quartz movement with outstanding finishes, this limited edition ‘Laureato’ brings together two areas of Girard-Perregaux's expertise: a unique style and an exceptional movement. Aimed at collectors, this watch offers a modern take on those features that ensured the success of the ‘Laureato’ collection. Since its creation in 1975, it has embodied two of Girard-Perregaux's core values: innovation and design. Conceived to celebrate the Manufacture's technological advances, the Laureato's design was based on that of 1970s sports watches, breaking away from the classic watchmaking design traditions. The model's design is characterised by a polished octagonal relief bezel which contrasts with a satin-finished integrated bracelet. A decade later, the first development to the model took place, adding complication movements. In 1995, the watch was completely redesigned and rebuilt to accommodate the Manufacture's GP3100 mechanical self-winding movement: it was enlarged, its bezel widened and its bracelet links took on the form of an H. In 2003, it underwent a new transformation, both ergonomically and mechanically. Numerous complications were offered, including a version with a Tourbillon with three sapphire Bridges. The ‘Laureato’ collection thus evolved over the years, while still retaining its instantly recognisable, striking form: an octagonal bezel with elegantly alternating polished and satin-finished surfaces, and a case with matching integrated bracelet. This limited edition further hones the model's ergonomics. Its refined profile fits beautifully on the wrist. The steel bracelet is perfectly integrated with the case. To emphasise the dynamic style, the grey dial is decorated with a chequerboard motif. The applied hour markers and the flange supporting the minute indicator add extra depth to the design. The hour and minute hands are luminescent for easier reading in the dark, while the second hand is outlined in red. 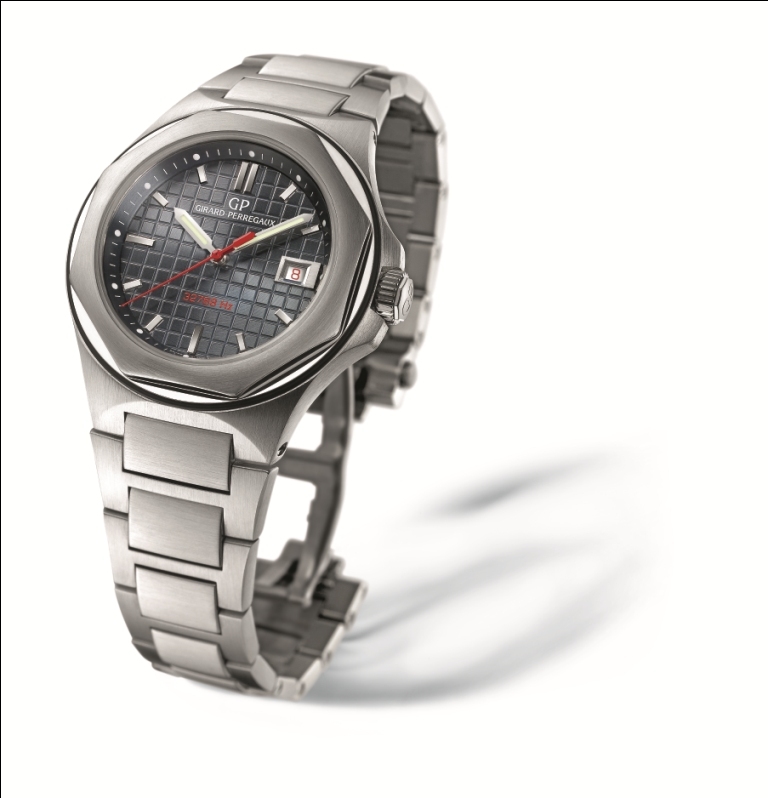 This subtle touch of scarlet is echoed on the date indicator, inspired by the 1970's, and on the inscription "32 768 Hz". This is found at 6 o'clock, as a tribute to Girard-Perregaux's leading role in advancing quartz technology. The reference to this technological advance continues into the very heart of the watch itself, which is equipped with a new quartz movement. The GP13500 naturally oscillates at a frequency of 32,768 Hz. It is produced in Girard-Perregaux's own workshops, which focus as much attention on its technical performance as on its outstanding finishes. The transparent case-back reveals the movement with its "Côtes de Genève" decoration and blued steel screws. The battery cover is customised, evoking the famous Girard-Perregaux Tourbillon and stamped with the Manufacture's logo.